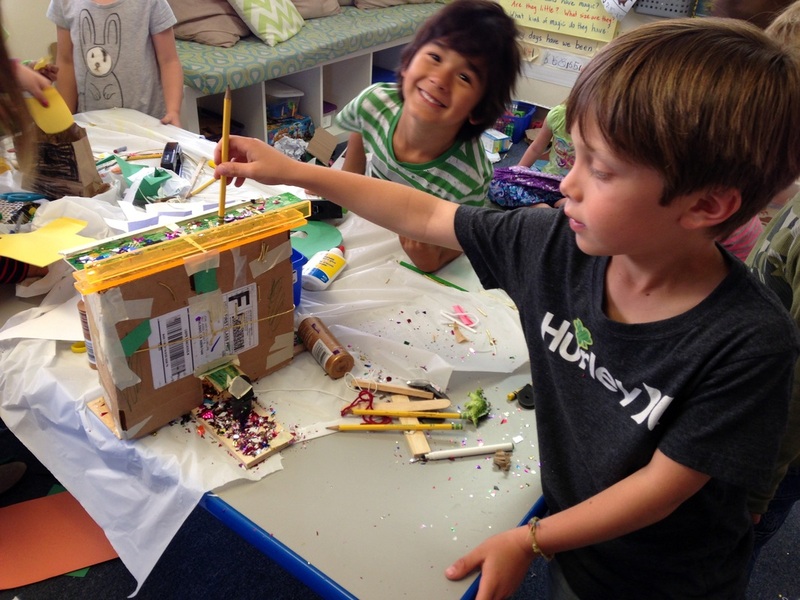 Making Leprechaun traps in Kindergarten could help your child get a job later in life! I am not the first teacher to have her students make leprechaun traps. This is not a new idea. My purpose for it, however, may be new. I spent this last weekend at a gigantic education conference in LA. Also in attendance were thousands of other teachers, principals, and superintendents from across the country. Speakers from the education and business world, such as Daniel Pink and Sir Ken Robinson, urged the audience to educate children for the new global economy. Business leaders and colleges are calling for students who are critical thinkers, creative, and know how to collaborate and communicate well. Of course we sill need to teach reading, writing and math but these are not the skills graduates are lacking these days. Students come out of college able to do advanced math but can they solve problems that are new and have not been explicitly taught? Can they overcome setbacks and think of creative solutions without giving up? Can they clearly explain their ideas to others? These skills need to be taught, starting in kindergarten. 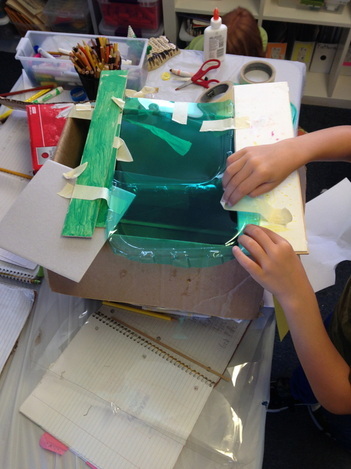 Many generations of students have made leprechaun traps but today it was about more than just fun. The students went through the Design Thinking Process that adults use in the real world. We started with a problem that we wanted to solve: "How can we trap a leprechaun." This naturally came up of course as soon as students walked in the door. They were all wearing green and discussing "Leprechaun Day." 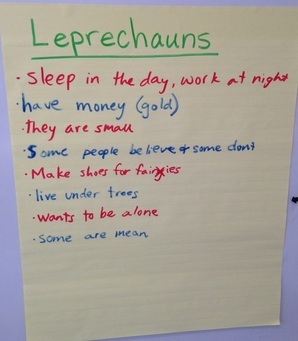 This led to a class discussion about what they knew and questions they had about St. Patrick's Day. Every child was practically yelling their personal knowledge on the subject to the rest...all at the same time. They were clearly engaged and had a connection to this topic. As soon as I told them that today we would try to make traps for leprechauns, they were hooked! They had trap ideas right away and started whispering them to their neighbors and calling them out to the class. This is where the project took a deeper thinking turn. We couldn't make a good trap without first understanding our subjects. This first step in the design process is called Empathy. We listed questions that we had about leprechauns and then listened to two books about them. After reading we charted what we learned. This sparked lots of discussion about what the trap should be made out of and what should be inside it. A debate ensued over which magic powers leprechauns have and what would entice them the most: gold or the color green. Next students brainstormed individually and we discussed what being creative actually means. We talked about using your imagination to think of an original idea. We also looked around the room and located different supplies we might use. After a bit of thinking on their own, groups of two or three formed and new ideas blossomed from the individual seeds. Collaboration, I told students next, is not the same as group work. When people truly collaborate, they make something together that could not have been accomplished by just one person in the group. In order to collaborate, individuals in the group need to give ideas, listen to other's ideas, and then build on those to create something together. This is especially challenging for kindergarteners and some students are just not developmentally ready for this yet. I noticed this early in the year during The Box Project. Some of the groups were able to truly work together and some worked side-by-side on their own projects. I specifically observed students today to see who was able to collaborate and who still worked individually. 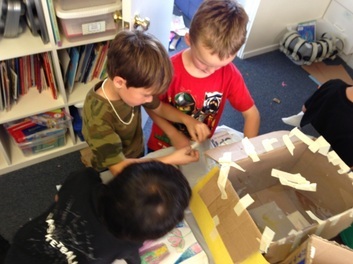 After planning with their group and choosing materials, students went to work building. I've seen our room messy before but today takes the cake! The entire floor was covered in sparkles, gold cording and pieces of cardboard! (This is why we do whole day projects and don't spread it over multiple days!) My favorite part of the day was listening to each group tell me how they would attract the leprechaun to their trap. Many solved this part of the problem quickly. Most planned to put something shiny or gold inside the trap. The "trap" part proved to be the most challenging. Many students had a plan to cut a rope or quickly shut the door after the leprechaun ran in after the gold. In an effort to make the inside of the trap lighter, this group changed their roof three times. This, second iteration used green translucent plastic. The first roof was made from wood and determined to make the inside too dark. The final version of the roof was made of clear plastic. Students explained that the Leprechaun was now more likely to come in because he could see the gold inside. This was one of many tests on the front door of the trap.